Be still my beating heart. A noble cowboy who leads with integrity and loves with honor but still makes some pretty big mistakes ends up taking the guardianship of a young woman to a level he never felt worthy of or anticipated. 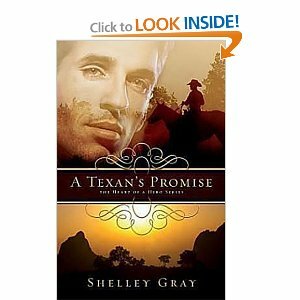 The Texan’s Promise is a sweet romance by Shelley Gray takes you on a journey from Texas to Colorado and a few places beyond a few years after the Civil War has passed. Clayton Proffitt rescues the daughter of his now deceased employer and pledges to himself to guard her with his life. The journey they take to freedom and love embroil them in danger and bind them even tighter. This book looks at the darker side of life on the southern frontier of early America and the hardships that especially befell women of that time if they were unprotected. Shelley Gray takes that darkness and shines the light of Christ into the midst of the pain and suffering with a light and gifted hand. I fell in love with Clayton and Vanessa and while I was grateful that the story had a happy ending, I was sad to leave them behind because I had grown fond of them and their relationship. If you want a journey into honor and valor and women who don’t remain victims, then this is a wonderful book. The growth all the characters take is beautiful. Thank you Shelley for sharing this story with the world.